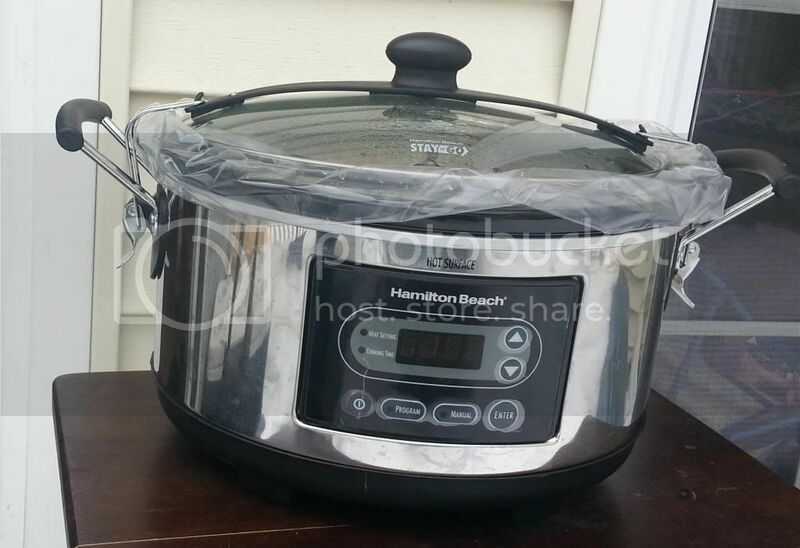 I love cooking with my crock pot It is so easy and your house smells absolutely delish! But during the winter season I admit that I don't use it as often. While I really love the way my house smells when my crock pot is on, I really hate the way the house smells the next day. Sometimes I think I have more issues than a magazine rack and one of them is smell issues and I just can't stand left over food odors in my house. I also hate leaving a restaurant and smelling like food, it's in your hair and your clothes - like I said, I have smell issues. Anyway, during the summer I have all the windows and doors open but you really can't do that during the winter months. I just don't like how food odors get trapped in your drapes or walls or even upstairs in the bedrooms and it can linger for a few days. My solution to that is putting the crock pot outside. I have a tray table that I can put on my back deck and that is where I set my crock pot on. My house will still smell good from going out and checking on it but it's not a strong smell and I can always burn a candle if I need to. Actually, when I was writing this post I had to run out and when I was in my car I could still smell crock pot smell on my jacket. As soon as I got home I threw my jacket in the wash! It totally drove me insane. How about you, are you as neurotic about food smells as I am?